Free shipping to Mainland USA on all orders of $300 or more! Email us [email protected] for an exact quote on shipping your order to Canada or to other countries. 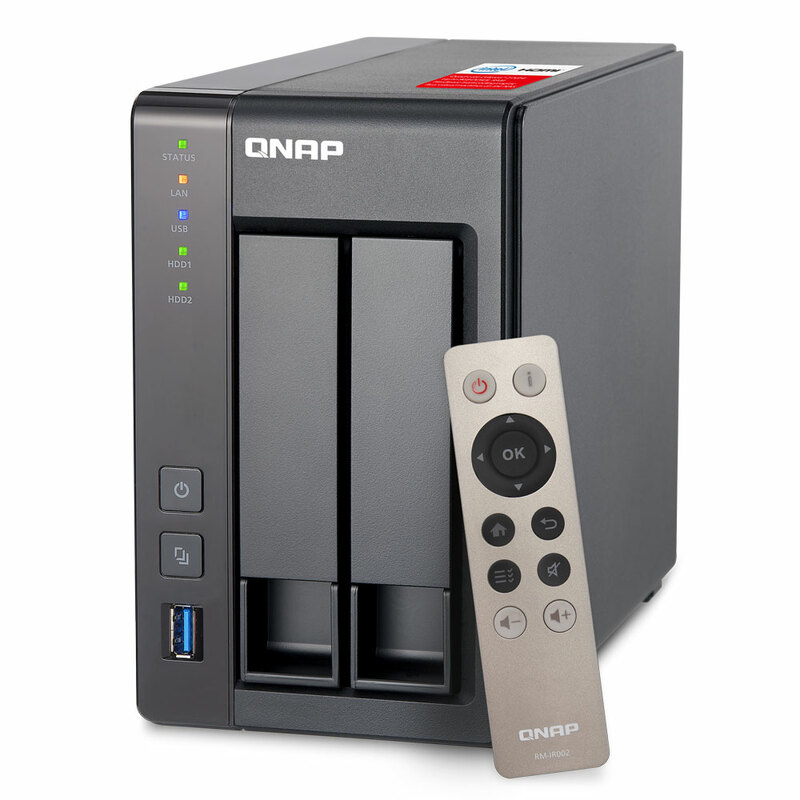 We carry the complete line of Qnap products. If you do not see the item you are looking for, please email us at [email protected] or call us Toll Free at 1-888-445-8375. Facing the increasing demand for data storage, sharing and multimedia processing, more and more users are looking for a NAS system with good performance and an affordable price tag. The Intel® quad-core TS-251+ provides an uncompromising high-performance scalable storage solution for professional and home users. Powered by the intelligent QTS 4.2 operating system, the TS-251+ performs as an easy-to-use yet powerful NAS for data backup, file synchronization and sharing, remote access and multimedia applications, and is ideal for users to create a secure private cloud to access their data easily. Note: Hard Drive sold separately. Which video formats support hardware acceleration? How to transcode videos to formats suitable for other devices? The TS-251+ is powered by a 64-bit Intel® Celeron® quad-core 2.0GHz processor and has 2GB/8GB energy-efficient DDR3L RAM (upgradable to 8GB) an dual gigabit LAN ports, delivering up to 225 MB/s read & write speeds with port trunking mode. The TS-251+ can also automatically increase the processor's clock rate from 2.0GHz to 2.42GHz when needed for CPU-intensive tasks. The TS-251+ supports AES 256-bit volume & folder encryption with transfer speeds of up to 205 MB/s, boosting system performance & security while ensuring the safety of sensitive personal data stored in the TS-251+. Tested in QNAP Lab. Figures could vary by environment. QNAP's exclusive QvPC Technology consolidates a number of high-end technologies including VM integration, multimedia transcoding, HDMI output, cloud integration and NAS connection technologies, allowing users to operate the TS-251+ as a PC when they plug in a keyboard, mouse and HDMI monitor. With QvPC Technology, the TS-251+ is transformed into a cost-effective device with PC functionalities for users to directly access stored data, run multiple applications using Windows®/Linux®/UNIX®/Android™ based VMs, surf the web, enjoy Full HD videos with Kodi™, monitor surveillance live feeds from IP cameras in real time, and much more. QNAP HD Station integrates the powerful Kodi™ media player and web browser. With HDMI connectivity, you can connect the TS-251+ to a HDTV to watch your rich multimedia content on the big screen. The splendid user interface and support for 7.1-channel audio passthrough* bring smooth playback of 1080p videos**. You can even watch YouTube™ videos, surf the web and manage the TS-251+ using Google Chrome™ or Mozilla Firefox® with multilingual keyboard input. HD Station supports multi-tasking and user authentication so only authorized users can access the stored data via HDMI monitors. The TS-251+ is packed with the QNAP RM-IR002 remote control for you to conveniently control HD Station via the built-in IR receiver. You can also turn your mobile devices into remote controls by installing the Qremote app. HD Station also supports YouTube Pairing, allowing you to select a YouTube™ video on your smartphone, tablet or computer and play it on your HDTV via the TS-251+. ** The quality of video and music delivery may vary depending on hardware and network environments. The TS-251+ delivers superior real-time Full HD video transcoding to convert your videos to formats that can be smoothly played on PCs, mobile devices and Smart TVs. It allows for multiple devices to simultaneously view different videos stored on the TS-251+ with on-the-fly hardware accelerated transcoding, saving your time in converting videos to different formats for different devices. With the benefits of offline transcoding, if you can only connect to an Internet connection with limited/restricted bandwidth, you can still enjoy smooth videos via File Station, Video Station, or the Qfile app by selecting a pre-rendered lower-resolution video, saving system resources of the TS-251+ for other applications. The TS-251+ also allows you to set a dedicated folder for automatic video transcoding. Use your TS-251+ as a multi-zone multimedia system to fill every corner of your house with your choice of media. You can centrally manage and stream photos, music and videos from the TS-251+ to different rooms from a single device using Bluetooth® & USB devices connected to the TS-251+ (for music streaming only), HDMI, DLNA®, Apple TV® and Chromecast™*. Every room member in different zones can enjoy the convenience and simplicity for media playback and multimedia storage. Alternatively, to enjoy multimedia yourself, you can choose DLNA-compatible devices, use the Qfile app on an iOS® device to browse videos/photos and play on the TV via Apple TV®, install the QAirplay&Chromecast app from the QTS App Center to stream media content directly on a TV via Apple TV® or Chromecast™, or transform the TS-251+ into a powerful streaming machine with DLNA®, Roku®, Amazon® Fire TV, and Google TV™ support with the support of Plex Media Server. *To stream multimedia via Chromecast, you must first install the multimedia extension pack from the QTS App Center. It's never been this easy to stream your multimedia content on your HDTV. Use DLNA-compatible devices such as HDTVs, Smart TVs, Sony® PS3, Sony® PS4, Microsoft® Xbox 360 and Hi-Fi systems to enjoy HD quality videos and high-resolution audio content such as DSD (Direct Stream Digital) audio format stored on the TS-251+. You can also use the NAS as your Plex Media Server, which organizes all of your media and allows you to access all your movies and media on your mobile phones and tables. The TS-251+ is a powerful streaming machine that can be accessed through DLNA, Roku (Qmedia app), Apple TV, Amazon Fire TV, and Google TV. Thanks to the intuitive user interface of QTS 4.2, your NAS experience is smarter, smoother and spectacular. Its modern flat design streamlines loading times, and the intelligent desktop allows you to quickly find desired functions, create desktop shortcuts or group shortcuts, monitor important system information on a real-time basis, and open multiple application windows to run multiple tasks concurrently, bringing greater operating efficiency. QTS breaks the barriers of devices, platforms and geography to bring optimized cloud experiences to you, and incorporates more advanced features including volume/LUN snapshot, remote connection to public cloud services in File Station, multi-zone multimedia system, and more. Quickly and easily find documents, photos, videos, and music with Qsirch, QNAP's new built-in NAS search application lets you find what you need by real-time, natural search. Simply type in as much as you know about what you are trying to find, including parts of the file name or even words/phrases in the document, and Qsirch will display a list of matches, complete with thumbnails, as you type. Qsirch even remembers your search history so you can quickly navigate to files you've previously searched for. Qsirch is a huge productivity boost that greatly reduces the amount of time spent looking for files on the NAS so you can focus on other tasks. The Virtualization Station transforms the TS-251+ into a 2-in-a-box NAS that can function as an all-in-one NAS and a virtualization platform that supports multiple operating systems, fast VM creation, VM backup & restoration, VM import/export, snapshot, Device Management for centrally managing VM, and enables desktop operations on web browsers. With the easy-to-use interface, you can centrally manage all of the VMs created on the TS-251+ with minimal effort. You can also download VMs on demand from online VM markets and import them to the TS-251+ without any complex procedures. QNAP Container Station exclusively integrates LXC and Docker® lightweight virtualization technologies, allowing you to operate multiple isolated Linux® systems on the TS-251+ as well as download apps from the built-in Docker Hub™ Registry. It supports container import/export and permission settings, and features an informative dashboard and flexible user interface for you to manage multiple containers. You can experience the amazing Container Station and enjoy the playground of virtual containers with the TS-251+. The TS-251+ supports SMB/CIFS, NFS, and AFP protocols for file sharing across Windows®, Mac® and Linux®/UNIX®. Data, logs and ISO image of CDs and DVDs can be centrally stored in the TS-251+ and protected by an integrated antivirus solution. The web-based File Station enables you to easily upload, download, and manage files on your TS-251+ wherever there is an internet connection. Supporting file extraction, folder creation, and smart search for files and folders, the File Station also allows you to easily share files with friends & family via unique URLs, email, and a shared space. What's even better, you can also directly browse and transfer files between the TS-251+ and public cloud services like Google Drive™, Dropbox®, Microsoft® OneDrive, Box®, Yandex® Disk and Amazon® Cloud Drive through File Station, and view files with Office Online and Google Docs™ or directly open them with a Google Chrome™ office extension. QNAP NetBak Replicator supports real-time and scheduled data backup on Windows including Outlook email archiving. Apple Time Machine® is also supported to provide Mac® OS X users with a solution to effortlessly back up data to the TS-251+. The front panel USB 3.0 port on the TS-251+ features a one-touch-copy function for you to instantly back up data on external drives to the TS-251+ with just one click, or alternatively to back up data from the TS-251+ to external drives. A wide range of third-party backup software such as Acronis® True Image and Symantec® Backup Exec are also supported. The TS-251+ offers various data recovery options. RTRR (Real-Time Remote Replication) supports real time and scheduled data backup to remote QNAP NAS or FTP servers and synchronizes files to remote folders from local folders with better backup efficiency. You can enjoy backup versioning to preserve a certain amount of versions, with options of simple versioning to schedule how many versions should be retained and for how long, or smart versioning with a rotation scheme that automatically replaces earlier backup versions. The TS-251+ also supports rsync protocol to back up data to remote servers on a scheduled basis. Data can also be backed up to and restored from a range of cloud storage services, including Amazon® S3, Amazon® Glacier, Microsoft® Azure, ElephantDrive®, Dropbox®, Google Drive™, Google Cloud Storage™, and more. Not limited to high-end models, the TS-251+ brings the highly-anticipated snapshot function for your flexible usage. QTS Storage Manager adds an easy-to-use web-based snapshot tool for you to easily back up and restore data on the TS-251+ back to any point of time to prevent loss of important data. You can take up to 256 snapshots for both volumes and LUN, efficiently replicate volume/LUN snapshots to remote servers by copying only the changes made, and quickly clone a volume /LUN snapshot as a local volume without interrupting the current system operation. You can even set up the system to automatically take a snapshot of the volume before backup via RTRR/rsync, even when the file is opened. In open network environments, data on the connected devices may be exposed in a potential hack. The TS-251+ provides numerous security options, such as 2-step verification, encrypted access, IP blocking, and more. Administrators can also control the access rights of each user to different folders, preventing unauthorized access to important files. The TS-251+ is validated with military-level FIPS 140-2 AES 256-bit encryption, preventing sensitive data from unauthorized access and breach even if the hard drives or the entire system were stolen. The TS-251+ can be a VPN server with L2TP/IPsec, OpenVPN, and PPTP support, allowing you to securely access data shared within the private local network. The TS-251+ also supports VPN Client for PPTP and OpenVPN to protect your privacy during data transmission. With Qsync, your TS-251+ is turned into a safe data center for file synchronization. Any file uploaded to the TS-251+ will be made available for all linked devices, such as computers, laptops and mobile devices. Qsync is especially useful for frequent travelers in managing files and ensuring that different devices have the most up-to-date files. Qsync provides multiple ways for file synchronization and group file sharing, greatly enhancing the flexibility of team projects and collaboration. The centralized configuration allows you to remotely erase the Qsync folder on a lost device to avoid data breaches, and even restore it after you have retrieved the device. The TS-251+'s Surveillance Station offers a professional surveillance solution with a user-friendly management interface, a wide range of over 3,000 compatible IP camera models, and expandable IP camera channel licenses. It supports real-time monitoring, video & audio recording and playback with a wide range of customizable settings. You can also install the Vmobile app on your iOS® or Android™ devices to manage the monitoring of cameras anytime, anywhere, to safeguard your office environment, or install the Vcam mobile app to turn your device into a network camera to instantly record to your TS-251+. The TS-251+ offers 2 free IP camera channels and you can expand up to 40 channels by purchasing additional licenses. The TS-251+ is your private cloud storage that virtually enlarges the capacity of your smart mobile devices. Qfile allows you to access, upload, download, manage, and share stored files easily as if you are carrying tons of files in your pocket. If Qfile is installed on an iOS® device, users can also browse videos & photos stored on the TS-251+ and play on a TV via Apple® TV. Qmanager lets you monitor & manage the TS-251+ remotely and efficiently without turning on your PC. You can take and share digital notes with Qnotes, and enjoy and share music, photos and videos on the TS-251+ anywhere and anytime with Qmusic, Qphoto and Qvideo apps. The TS-251+ has a built-in App Center that provides various install-on-demand apps developed by QNAP and third-party developers, including tools for backup/sync, business, content management, communications, download, entertainment, and much more. It is also a centralized location for managing & updating installed apps. In addition, QNAP's development platform embraces the open-source spirit to enable developers to create their own apps, adding potentially limitless potential for the TS-251+. The TS-251+ supports online capacity expansion for archiving rapidly growing data by connecting a QNAP expansion enclosure. 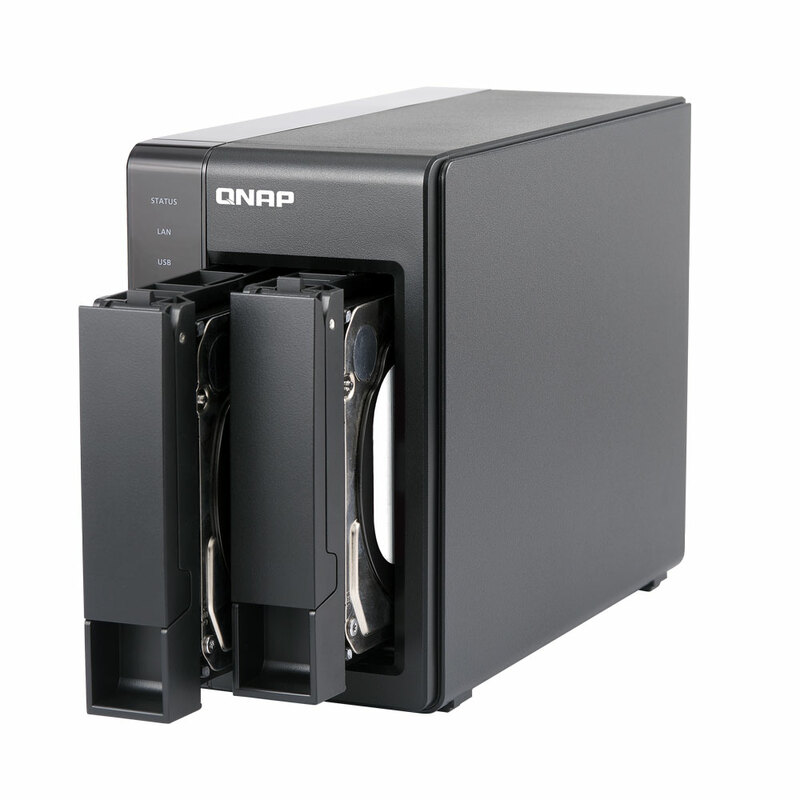 With the QNAP scale-up solution, the raw storage capacity can be expanded on demand, making the TS-251+ an ideal file center with large storage capacity for personal video collections. 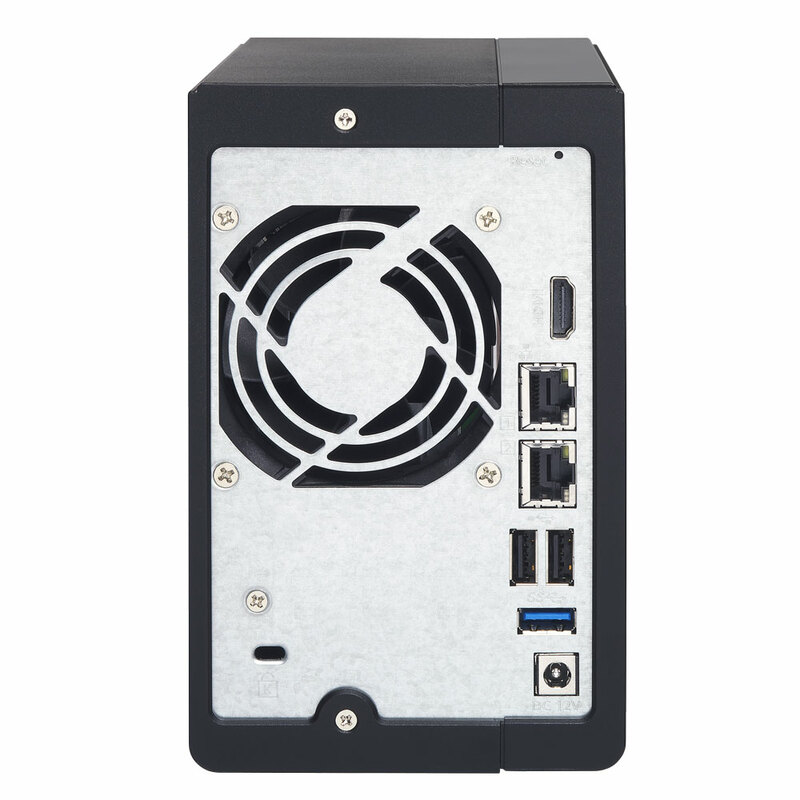 With the support of QJBOD Express (JBOD enclosures roaming)*, you can just connect a large capacity QNAP expansion enclosure to the TS-251+, and migrate data to another NAS through the JBOD enclosure without network connectivity. *RAID groups of storage pools cannot cross multiple enclosures. The TS-251+ utilizes a 22nm CPU and DDR3L RAM which feature low voltage, low power consumption, maintaining high performance in system operations with the benefit of energy-saving. Other eco-friendly designs include S3 sleep mode, HDD standby, scheduled power on/off, hard disk standby mode, and Wake on LAN. 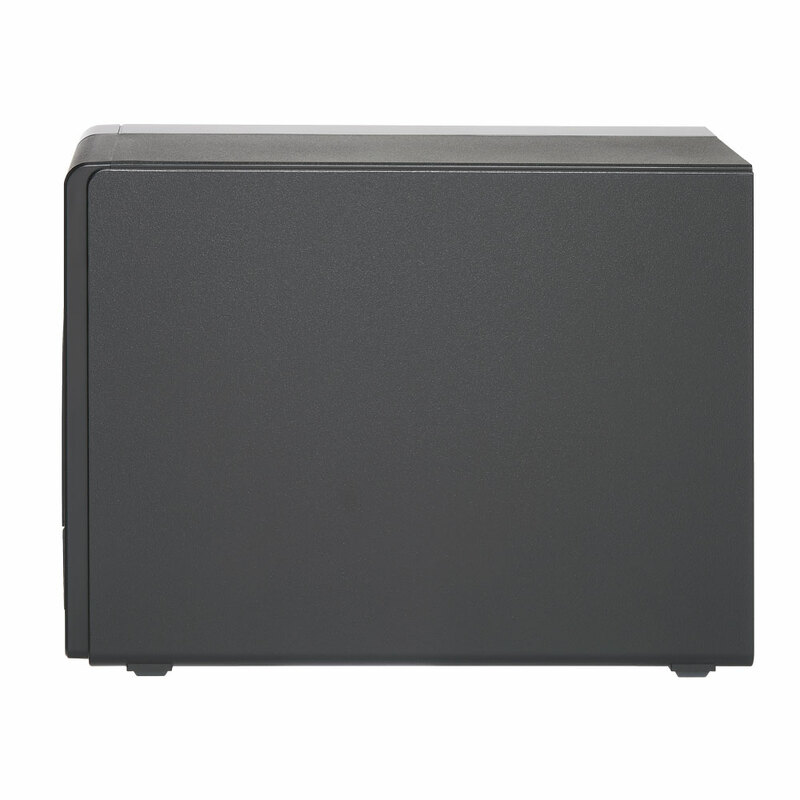 QNAP also packs the TS-251+ in an eco-friendly box to minimize the environmental impact. The TS-251+ provides comprehensive system tools to increase management efficiency. With the SMTP and SMS settings on the Turbo NAS, system administrators will get notifications via SMS or email if an error occurs. The Turbo NAS supports Syslog server that collects logs from various connected devices over the Internet and saves the data, enabling centralized log management with greater efficiency. The TS-251+ supports various applications for home offices as an all-in-one Turbo NAS with cost-efficiency. The Turbo NAS supports Web server which allows numerous websites built on the same server conveniently. Administrators can manage up to 32 websites on the single one Turbo NAS for reduced IT costs. Learn more other home office features. 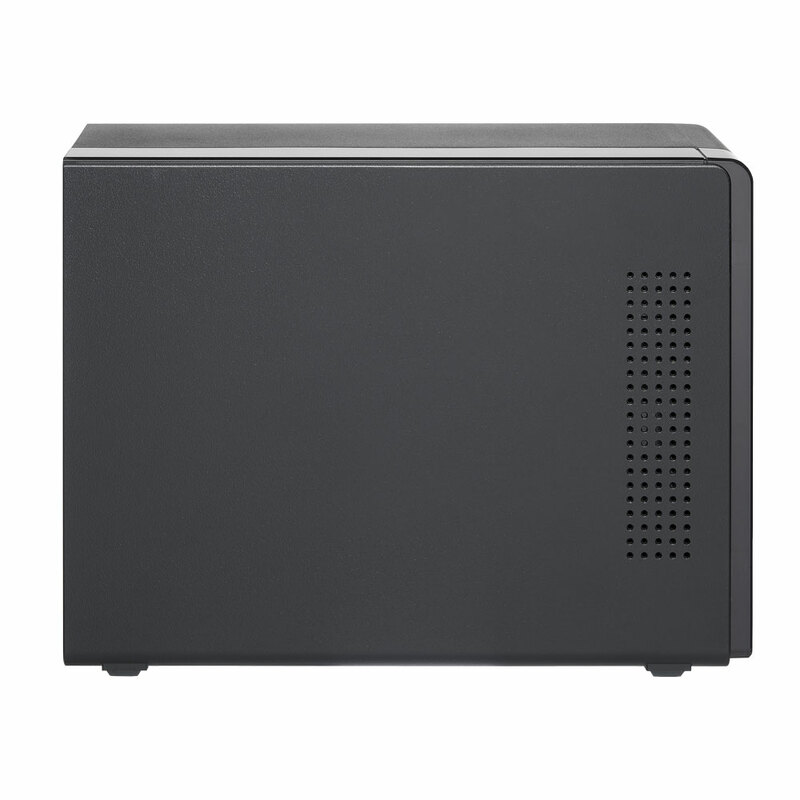 Visit the manufacturer's webpage for this NAS. Read our Pre-Sale FAQ. We have many After-Sale Support FAQs, depending on your needs. With so many products and features, making the right surveillance decision to suit your needs can be difficult and at times an overwhelming process. But don't worry - DuncansOnline is always here to help you. Contact us toll-free or by email anytime to set up an in-depth consultation free of charge! We're here to help you find the perfect surveillance solution! Copyright CCTVGold - DuncansOnline. All Rights Reserved. eCommerce Software by 3dcart.